8" x 2" Waterproof, self-stick water bottle labels. Personalized with your text and colors. 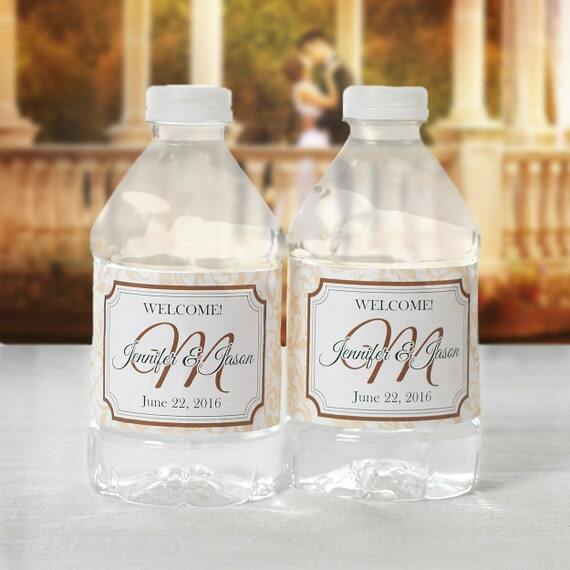 Add a little flair to your wedding tables with these personalized water bottle stickers! Made with 100% waterproof material that will not fall apart when submerged in ice or water. These labels have adhesive backing for easy application! Please read below for our recommended list of bottles that these labels will fit. 3. Enter the text and colors in the personalization box. 1. Most orders are shipped within 24 hours of proof approval, but please allow up to 3 days in house printing time unless you need a rush job. 2. We can almost always accommodate rush orders, convo us for details. 4. Please contact us if you require shipping upgrades, including 2-3 day priority and Overnight Express. Printing beautiful labels is what we're all about! If you're looking for a top notch team that will deliver top quality personalized labels, we're ready and waiting to help you. Go ahead and message us and 90% of the time you will get a response within minutes. There are dozens of brands of bottled water and many brands are regional meaning we don't ever see them in Florida. Several brands are listed below that we have tested with excellent results. Many other brands will also work. Just be sure that the label is 8" or less around the bottle and 2" or less from the top of the label to the bottom. 1. Aquafina 16.9 oz. 12 oz. and 8 oz. *Please note: Brands and bottles are subject to change according to their makers. This list is meant to be used as a useful tip, not a guarantee on application. Results may vary. This information is provided as a guide not a guarantee of perfection. LabelsRus assumes no responsibility for application issues. We recommend testing a few different bottles to see which one works best for your needs. 1. Get the sturdiest bottle you can find with the least amount of ridges. 2. If you get a bottle with ridges where the labels will be applied, make sure the ridges are even. This will make your label look much straighter with minimal wrinkles. 3. Always remove the existing label before applying the personalized labels. 4. Never apply the labels to wet bottles, always apply when dry. 5. When applying the labels we've found it helpful to lay the bottle on a clean flat surface and roll the label on after you've lined it up on the bottle. This makes for a nice tight and even application.